This Underwater Housing from Ikelite is a waterproof case enabling you to shoot beneath the surface with your Sony Cyber-shot DSC-WX300 digital camera. It has a depth rating of 200'. Mechanical controls provide access to all camera functions except for the control wheel, and most of the wheel's functions are accessible using the up/down and left/right buttons. The camera's built-in flash can also be used. 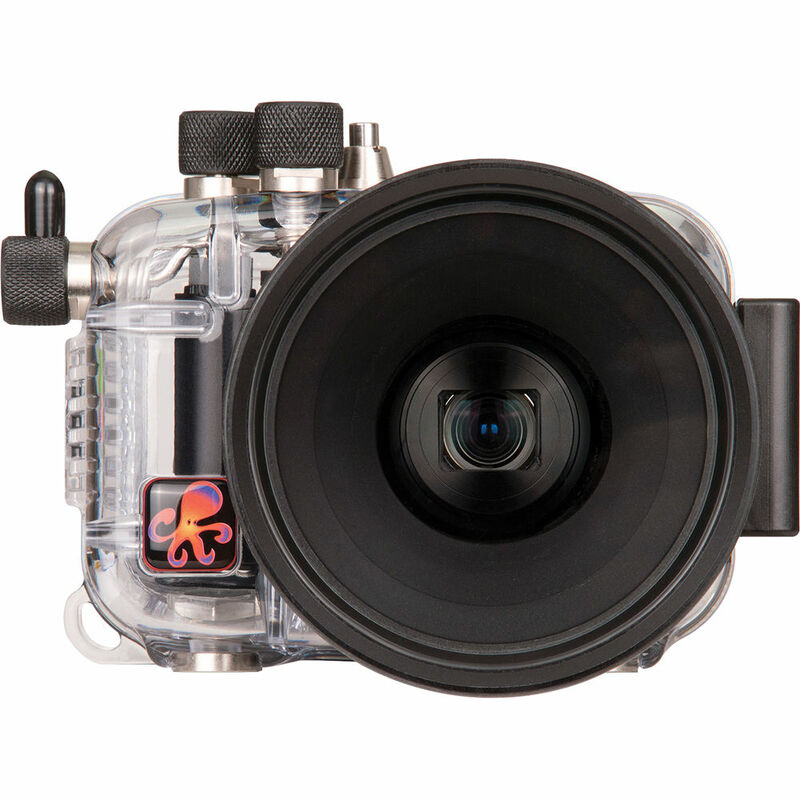 Built for durability, the housing is constructed by hand in the USA from corrosion-resistant polycarbonate, which is clear to allow you to monitor the o-ring seal and maintain a full view of the camera. The housing's built-in, flat glass port accommodates the camera's lens and also accepts optional, external wide-angle and macro add-on lenses. Expand your system by adding an optional AF35 AutoFlash strobe, which features a flex arm and mounts onto the grip handle of an optional tray. This external strobe is triggered as a slave by the firing of the camera's built-in flash and replicates TTL exposure. The housing comes bundled with a flash diffuser to soften the light of the camera's built-in flash and a flash deflector to redirect it towards an external strobe. The optional AF35 AutoFlash strobe features a flex arm and mounts onto the grip handle of an optional tray. The strobe is triggered as a wireless slave unit by the firing of the camera's built-in flash, and automatically varies its own power to replicate TTL exposure. The housing comes bundled with a flash diffuser to soften the light of the camera's built-in flash, and a deflector to redirect it towards an external strobe. Box Dimensions (LxWxH) 6.4 x 5.5 x 5.4"
Underwater Housing for Sony Cyber-shot DSC-WX300 Digital Camera is rated 5.0 out of 5 by 2. Rated 5 out of 5 by Don B. from looks great! It looks great and provides easy way to check on the seal by having full view on the seal.Great product! I will add m ore to this review when I come back from my trip to Maui to shoot many dive trips. Rated 5 out of 5 by Gilbert G. Jr. from Sony WX300/WX350 Housing Quality is what you receive. Follow the instructions for preparation and it works like a charm. Just holding it in your hand you feel quality. Will this fit the WX350? Yes it will! I bought this case specifically for my WX350. will this fit the sony a6300?